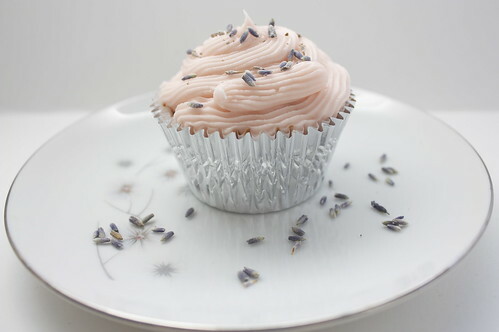 In addition to bringing French 75 jello shots to the party on Saturday, I also made champagne cupcakes with pink champagne frosting and sprinkled with lavender flowers. In the past, I’ve made cupcakes from the box with alternations, like the pink lemonade and vanilla coconut cupcakes I made in May, but this time I made them completely from scratch. I am a glutton for punishment (and baked goods). Preheat oven to 350 degrees F (175 degrees C). Prepare a cupcake pan with liners. In a large bowl, cream together butter and sugar until very light and fluffy. Sift flour, baking powder, and salt together, and then blend into creamed mixture alternately with champagne. In another large clean bowl, beat egg whites until stiff peaks form. Fold 1/3 of the whites into batter to lighten it, then fold in remaining egg whites. Fill the cupcake liners about 2/3 full. Bake at 350 degrees F (175 degrees C) for 20 minutes, or until a toothpick inserted into the cake comes out clean. With an electric mixer, beat together sugar and butter. Mix on low until well blended, and then on medium for another two minutes. Add vanilla, champagne and food coloring, beating on medium for another minute. 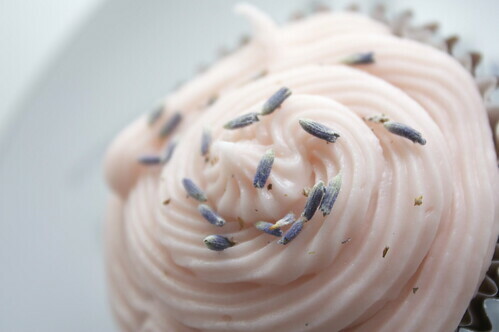 Fill piping bag and frost cupcakes, sprinkle with dried lavender. The cake for these cupcakes is dense and not too sweet, while the frosting is sugary and buttery. 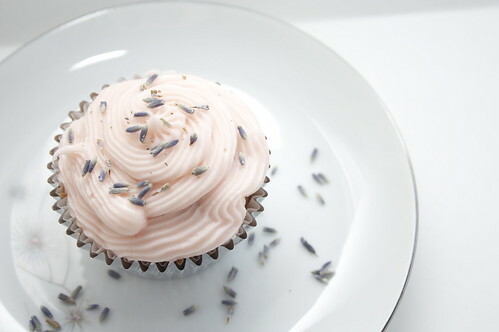 The lavender flowers add a really nice subtle flavor as well. Speaking of delicious cupcakes, if you live in New York and have yet to try Robicelli’s cupcakes, do it! They have the most innovative flavors and you can tell that they’re made with love (and lots of butter.) I have a hard time not stopping in to pick one up if I know there’s a vendor nearby (Try Radish on Bedford or Eastern District on Manhattan Ave.) Also, check out this Food.Curated video to meet the couple behind the cupcakes.